On 1st December the Lamborghini Veneno Roadster made its debut aboard the Italian aircraft carrier Nave Cavour in an exclusively Italian evening attended by VIPS and media. 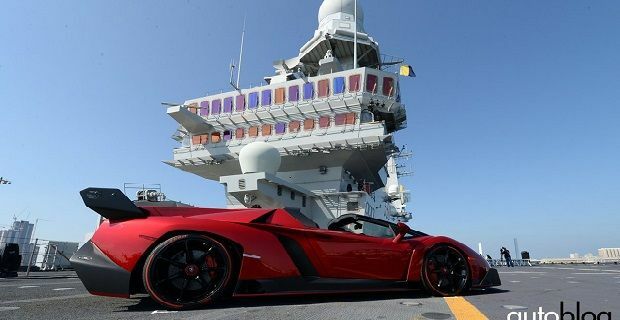 The limited edition super car was unveiled on the 240 metre long ship’s flight deck while it was docked in Abu Dhabi. The Lamborghini Veneno roadster’s top speed of 220mph might not be anything compared to the speeds generated by sort of hardware taken off from the aircraft carrier, and the £2.7million price tag is probably a tenth of the price of a decent fighter plane, but the performance and price are both breathtaking for a car. With only 9 available, we can see why Lamborghini choose to debut the car at a place where wealthy individuals rub shoulders every day. Power comes from a V12 that’s capable of producing 750bhp. That will propel the Lamborghini from 0-62mph in 2.9 seconds and onto the 220mph top speed we mentioned earlier. The exterior’s been painted in “Rosso Veneno”, a colour developed especially for this machine but each client will be able to “individualise” the colour of their Veneno Roadster. Aside from the colour and the open roof, the Veneno Roadster uses most of the parts developed for the hardtop version, which is even more exclusive than the open top machine as only 3 of those will ever be built.